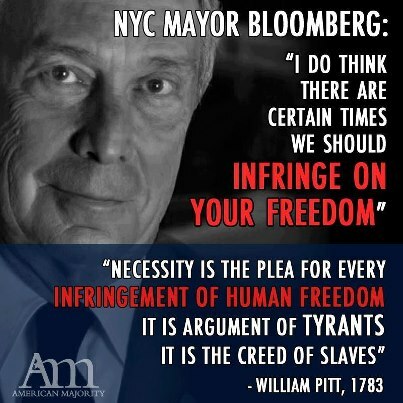 Perhaps the single most dangerous politician on the national scene these days is New York City Mayor Michael Bloomberg. He is dangerous in part because he appears to be a megalomaniacal would-be dictator and in part because he is a billionaire who is willing to spend considerable sums of his own money to achieve his blatantly unconstitutional political aims. To all of which, I say, NO, there aren’t certain times when you should infringe on our freedoms. “[It is] the people, to whom all authority belongs.” —Thomas Jefferson to Spencer Roane, 1821. “… all power is inherent in the people … it is their right and duty to be at all times armed ….” –Thomas Jefferson to John Cartwright, 1824. “But of all things, they least think of subjecting themselves to the will of one man.” –Thomas Jefferson to Francis W. Gilmer, 1816. “Governments are instituted among men, deriving their just powers from the consent of the governed.” –Thomas Jefferson: Declaration of Independence, 1776. “What country can preserve its liberties if its rulers are not warned from time to time that their people preserve the spirit of resistance? Let them take arms. The remedy is to set them right as to facts, pardon and pacify them.” –Thomas Jefferson to William Stephens Smith, 1787. “The spirit of resistance to government is so valuable on certain occasions, that I wish it to be always kept alive. It will often be exercised when wrong, but better so than not to be exercised at all. I like a little rebellion now and then. It is like a storm in the atmosphere.” –Thomas Jefferson to Abigail Adams, 1787. “Most codes extend their definitions of treason to acts not really against one’s country. They do not distinguish between acts against the government, and acts against the oppressions of the government. The latter are virtues, yet have furnished more victims to the executioner than the former, because real treasons are rare; oppressions frequent. The unsuccessful strugglers against tyranny have been the chief martyrs of treason laws in all countries.” –Thomas Jefferson: Report on Spanish Convention, 1792. “I hold it that a little rebellion, now and then, is a good thing, and as necessary in the political world as storms are in the physical. Unsuccessful rebellions, indeed, generally establish the encroachments on the rights of the people, which have produced them. An observation of this truth should render honest republican governors so mild in their punishment of rebellions, as not to discourage them too much. It is medicine necessary for the sound health of government.” –Thomas Jefferson to James Madison, 1787. The tree of liberty must be refreshed from time to time with the blood of patriots and tyrants. It is its natural manure.” –Thomas Jefferson to William Stephens Smith, 1787. Thomas Jefferson — remember him, Michael? You couldn’t carry his slop jar.